In Part 1 we created VNet and in Part 2 we talked about how to create new VM. Once your VM is deployed, it’s ready to be used for whatever purpose you have for it. But you’ll probably want some of VMs to be accessible from outside your VNet, especially if this VM is webserver with IIS role installed. For this we need to configure NSG – Network Security Group. 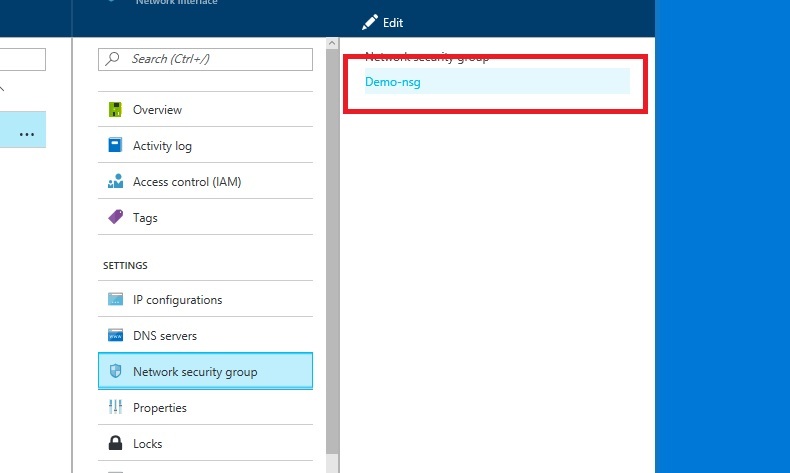 NSG contains a list of Access Control List (ACL) rules that allow or deny specific traffic on your VM in your VNet. NSG can be associated with either subnet in VNet or individual VM instance where subnet rule applies to entire subnet and individual rule applies to specific VM. In this case we’ll talk about opening port 80 (http) so your webserver can be accessed over internet. I also got lot of questions about this specific subject (in person, e-mail, forums) as a lot of people have issue setting up HTTP in ARM. 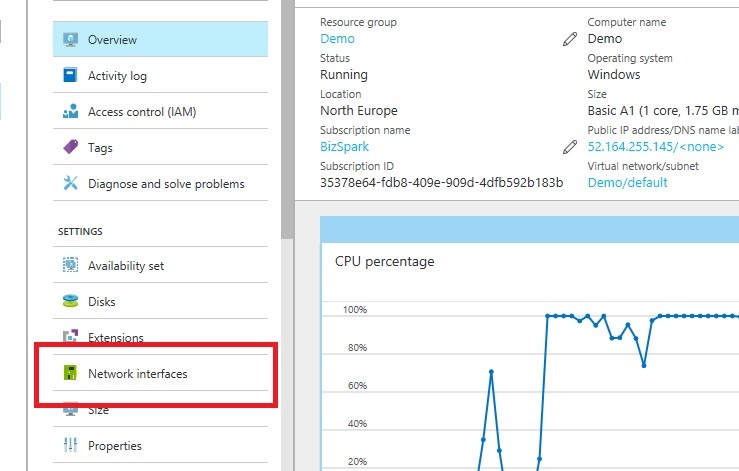 First go to ‘Virtual Machines’ in Azure portal. 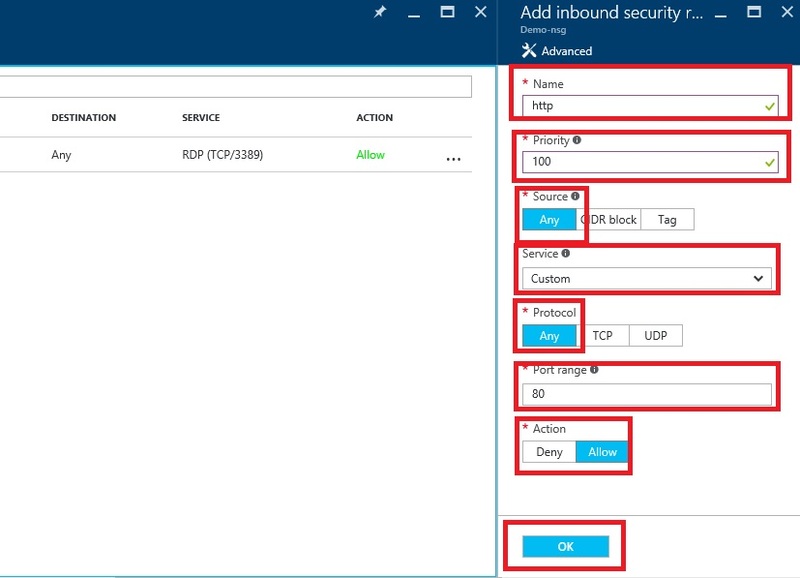 Select VM with IIS role from list of your VMs. In new tile, select ‘Network Interfaces’. Click on your network interface. 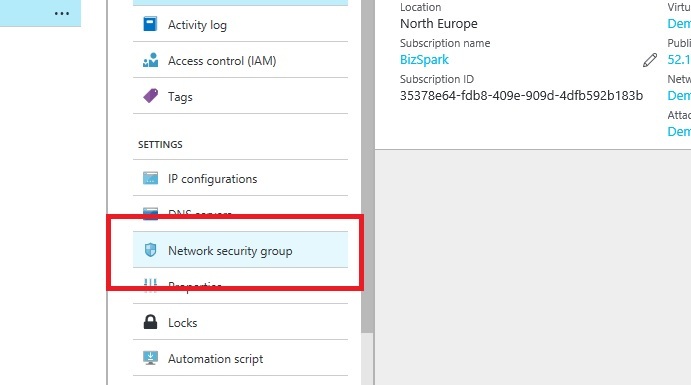 In new tile select ‘Network Security Group’. Select security group to edit. 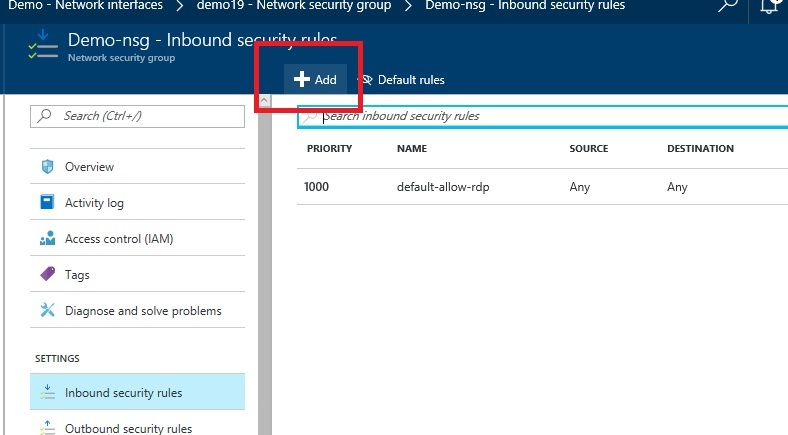 In new tile, select ‘Inbound security rules’. Click ‘Add’ and wait for new tile to open. You need to enter parameters for new rule. First enter name for your rule (‘http’ in this case but can be anything, I just find it easier to manage when name tells me what it’s about), set priority to ‘100’, Source to ‘Any’, leave service as ‘Custom’, set protocol to ‘Any’, enter 80 for port range and set action to allow. Finally click OK and wait for few seconds (this can vary but usually it’s created under 1 minute). Once your rule is created, go to your VM overview page and check your Public IP address/ DNS name. 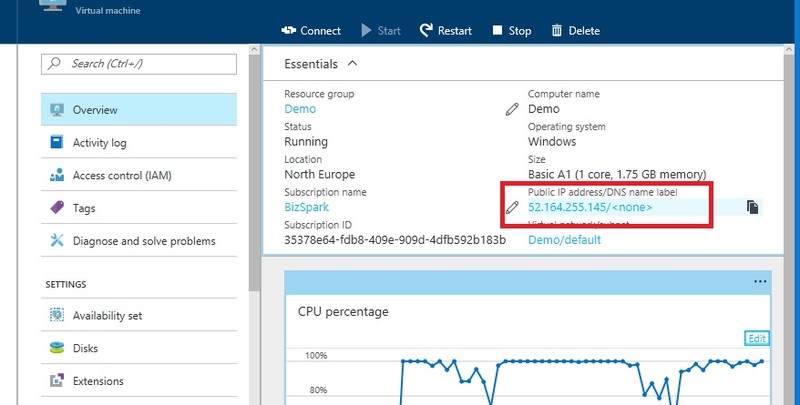 Enter your IP address to browser and here it is – your IIS server is accessible from internet and ready to be used. I’m System Engineer at Authority Partners. I love to test and explore new technologies. Have over 20 active MS certificates such as MCSA for Windows Server and SQL Server, MCSE Private Cloud, Data Platform, Business Intelliegence and Server Infrastracture. 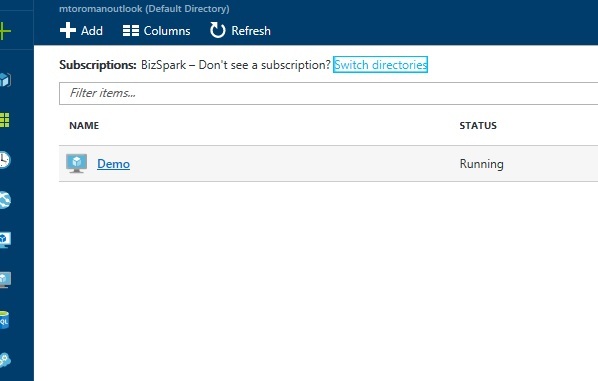 Lately most interested in BI and Azure solutions. MCT since 2012. From 2016 MVP for Microsoft Azure. Hello to all, it’s really a good for me to visit this web site, it includes important Information. of course I like your website, I’ll certainly come again again. Thanks for another informative blog. I have a project that I’m just now working on, and I’ve been on the look out for such information. Tip top stffu. I’ll expect more now. after that i advise him/her to pay a visit this weblog, Keep up the nice job. your information. Your article has truly peaked my interest. I’m going to bookmark your website and keep checking for new details about once a week. Find this link in MSDN forum. Saved me! You saved me. I spent hours trying to figure it out. Who would thought just changeing from http to custom would fix it. Thank you! I tried default rules but couldn’t get it to work. This worked great. Thank you! Very quickly this website will be famous among all blogging people, due to it’s fastidious articles or reviews. Thank you for sharing! Keep helping community! Hiya! I simply wish to give a huge thumbs up for the good information you will have right here on this post. I might be coming back to your blog for more soon. I followed few posts on how to do this but this one WORKS! Thank you! Finally tutorial that works! Spent hours trying to figure what is problem with my NSG! Thank you and keep on! Tons of hot to do this but yours realy work! Thank you and keep writing! I appreciate so much for your time in writing this post. After study a few of the weblog posts in your website now, and I truly like your manner of blogging. I bookmarked it to my bookmark website checklist and shall be checking again soon. Hi there, just became aware of your blog through Google, and found that it is really informative. I’m going to watch out for brussels. I will appreciate if you continue this in future. A lot of people will be benefited from your writing. Cheers! I’ve been having problems with this for few days now, read lot of posts and articles. None of it helped me! 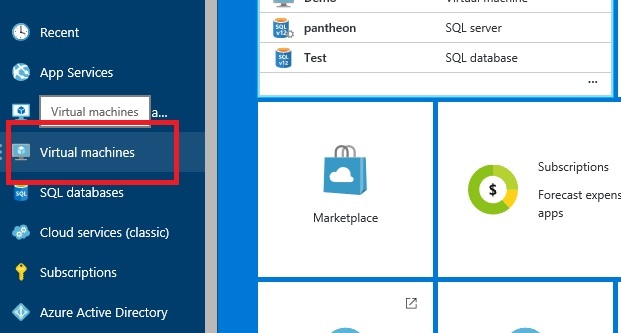 Finally I found answer on MSDN that pointed me to this blog. This tutorial actually works! Thank you very, very much! you are actually a good webmaster. The website loading pace is incredible. It sort of feels that you are doing any distinctive trick. Also, The contents are masterpiece. you’ve done a great process in this topic! I’m impressed, I must say. Truly rarely do I encounter a weblog that’s both educative and entertaining, and without a doubt, you’ve hit the nail on the head. Your notion is outstanding; ab muscles an element that there are not enough persons are speaking intelligently about. I’m happy i always found this at my search for something relating to this. This site is actually amazing. We constantly run into something new & diverse correct right here. Appreciate which data. Very good publish, thanks a lot for sharing. Definitely, what a fantastic site and educative posts, I definitely will bookmark your site.All the Best! You ought to experience a contest for just one of the most effective blogs on the net. I am going to suggest this blog! I like the valuable information you provide in your articles. I will bookmark your blog and check again here frequently. I am quite sure Iâ€™ll learn lots of new stuff right here! Best of luck for the next! Great post. I used to be checking constantly this blog and I’m inspired! Extremely useful info specially the ultimate part 🙂 I take care of such information a lot. I was looking for this certain info for a very lengthy time. Thank you and good luck. Thank you a lot for sharing this with all of us you really understand what you are talking approximately! Bookmarked.